According to Variety, Josh Gad is the latest actor in talks for Disney’s live-action Beauty And The Beast musical, currently starring Emma Watson as Belle, Dan Stevens as the Beast, and Luke Evans as Gaston. 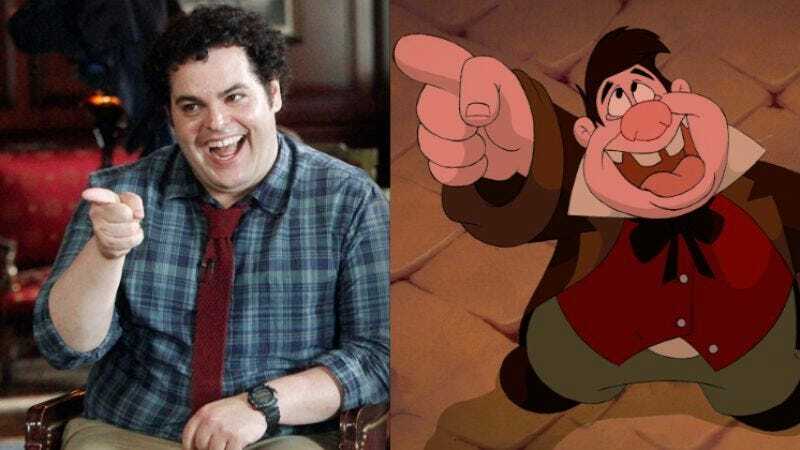 Assuming things are finalized, Gad will play LeFou, Gaston’s bumbling, much-abused sidekick in Bill Condon’s upcoming adaptation. Though the character is a supporting one, LeFou handles most of the heavy lifting in the delightful song “Gaston.” And considering the main cast aren’t exactly known for their vocal prowess, it makes sense to round out the supporting players with people who have actually sung professionally. In addition to turns in The Wedding Ringer and 1600 Penn, Gad has plenty of experience both singing and playing weirdo sidekicks—he was nominated for a Tony for doing both of those things in Broadway’s The Book Of Mormon. He also has a connection to Disney, having voiced Olaf the snowman (another bumbling, singing sidekick) in Frozen. With the role of LeFou now filled, all that remains to be seen is which Hollywood and/or Broadway legends get called upon to play a tea pot, a candelabra, and a clock.